A “quick-fix” for your pain or injury might sound good, but over time is proven to be inconvenient, costly and ineffective in comparison to taking preventative measures. The swift management of your pain and symptoms is only the first step we take to help you achieve lasting results. Our Results4Life® approach ensures you can enjoy a healthy, injury-free lifestyle without that lingering threat of injury re-occurrence. Whether your goals are focussed on rehabilitation, fitness, performance or lifestyle, your Back In Motion physiotherapist will work with you to create a tailored roadmap to achieve them. By using a defined path which measures progress, you and your physiotherapist are always on the same page because of this structured approach. Your physio will also equip and empower you with the tools and techniques to self-progress outside of the consulting room. 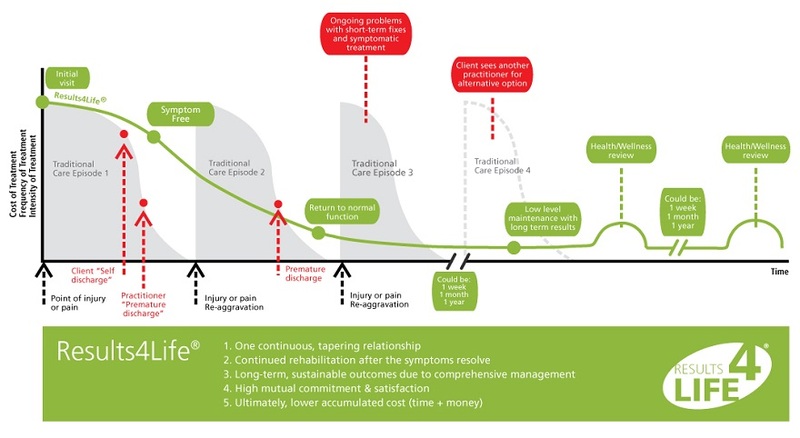 A tailored Results4Life® Roadmap for injury rehabilitation starts at pain and symptom management, moves to identification and treatment of underlying causes, before transitioning to a strengthening, fitness and lifestyle focus. In other words, during a single treatment cycle, the Results4Life® approach addresses the three key areas that are fundamental to lasting recovery from not only injury or pain-relief but treatment and prevention of injury re-occurrence. Our physios are also able to harness the benefits of multiple treatment methods including clinical Clinical Exercise, deep tissue massage, body vibration therapy, as well as hands on physiotherapy. This graph demonstrates a tailored treatment plan. You’ll notice that “quick-fixes” result in a pattern of re-occurrence, whereas Results4Life™ produces more sustainable results. Ask your physio how Results4Life® can help you in achieving optimal lifelong physical health.